Read about our wonderful growers, Staff, and volunteers! Sean, Mary & Tulsi live in on a half acre in Ainaloa and maintain Tulsi Gardens, a beautiful, edible forest garden. Sean & Mary love to get their hands on new and interesting edible plants, especially if they’re perennial. They have utilized permaculture in the design of their gardens and incorporate Natural Farming for the overall health of the plants. They are currently working on small scale production of edible and medicinal mushrooms. 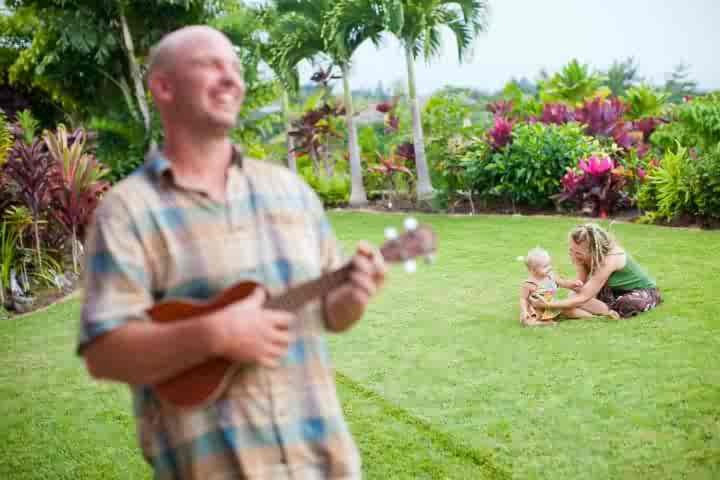 Sean & Mary are the founders of the Maku’u Backyard Growers Co-op and little baby Tulsi is their main Sales Representative. When are you going to start? Just gearing up here. Have you talked to Paula and Johnny at the market? We may start as soon as Feb 18th!! We’re very excited, looks like we have some a few fruits and veggies from local growers, hand crafted farmstead cheese made with big island milk, perhaps some local eggs, salt and guacamole as well. What do you think you might have available by Feb 18th? If that’s too soon, no problem, you can offer what you have in surplus at anytime. I do not know if we’ve spoken with Paula & Johnny, but maybe we should.